How do I put text on the select button/pull down menu? Click on the field, and then click on "Options" button on the toolbar. No you missed the point thats basic. I described it above. 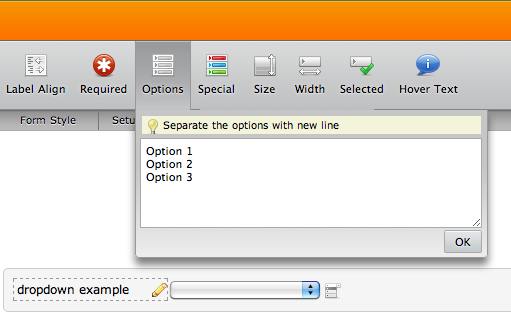 You click on "Options" button on the toolbar and change the options on the dropdown. Do you mean: How do you set a DEFAULT option to appear in the drop-down menu field button, rather than a blank space, such as "Please select" or whatever else you might want? yep you got it! can it be done? That's also perfectly possible. See the screenshot I posted above. Do you see the "Selected" button. Click on that to choose a default selected value.